Medical Supply Company instructions for ordering a Special Needs Safety Harness from Childharness.ca. Special Needs Autism Harness for clients. Please order through this website. You will receive a confirmation email detailing your costs. Your invoice will be a separate email direct from PayPal. Once we receive your payment, your order will be made and shipped to you. 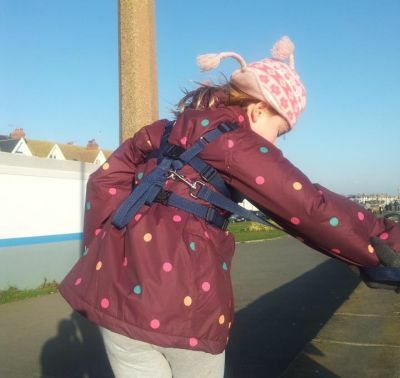 The HCPCS code for the Special Needs Safety Harness is "E1399, Durable Medical Equipment, Miscellaneous". First and foremost, please be sure to review all our Accessories with the family before ordering. should the harness have Locking Buckles to increase security? would Buckle Covers be enough? 95% of the harnesses made have the Permanent Handle; does your client need one as well? does the family need a Chair Strap to use when out in restaurants or for mealtimes or homework sessions? Would the Lead as a Tie-Down be a better choice? there is a time and place for Crotch Straps, are these something your client needs? By taking a few minutes to read about our Accessories and review them with the family, chances are excellent they will receive the right product. Payment is by credit card through PayPal. Instructions are provided in the confirmation email that you will receive after your order is reviewed. If you do not have a PayPal account, please take a moment to create one. We do not take credit card numbers in our office. There are NO TAXES on your order if you are outside Canada. We are a Canadian corporation, registered in Canada and we collect taxes on sales to Canadian customers only. Those taxes are then submitted to the Canadian government under our corporation number. Shipping will be with a tracking number to ensure receipt of the package at your end. Delivery to the USA is by UPS.